Download our app and ask your own questions about this exhibition during your visit. Here's one that others have asked. Lemme walk across the room, the first New York City solo exhibition by the emerging artist Eric N. Mack, transforms the Museum’s Great Hall with a site-responsive installation of new and existing textile-based works hung, mounted, and draped in conversation with the classical architecture of the space. 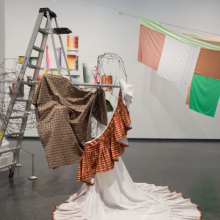 Mack’s work explodes the boundaries of painting, sculpture, and fashion, dynamically reflecting and framing the rich visual experiences of the everyday. New York–based Mack (b. 1987) considers the essential elements of abstract painting, including color, form, and gesture, but does so through a distinct focus on nontraditional materials such as multitextured and hand-stained textiles, pegboard, photographs, and images clipped from magazines. 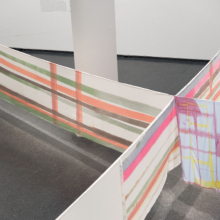 He encourages the viewer's intimate relationship with the work by folding, fastening, draping, or even suspending his paintings so that visitors can move about the space—walking among, or even under, the elements of his installation. 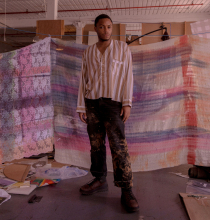 In this insistent consideration of how the viewer’s body relates to his paintings in real time, Mack’s work draws from not only sculpture but also fashion—a medium of particular interest to him with its potential for aesthetic experience within everyday interaction. Fashion and musical performance components further activate the exhibition, presenting painting as a living and multisensory practice. Eric N. Mack: Lemme walk across the room is curated by Ashley James, Assistant Curator, Contemporary Art, Brooklyn Museum. 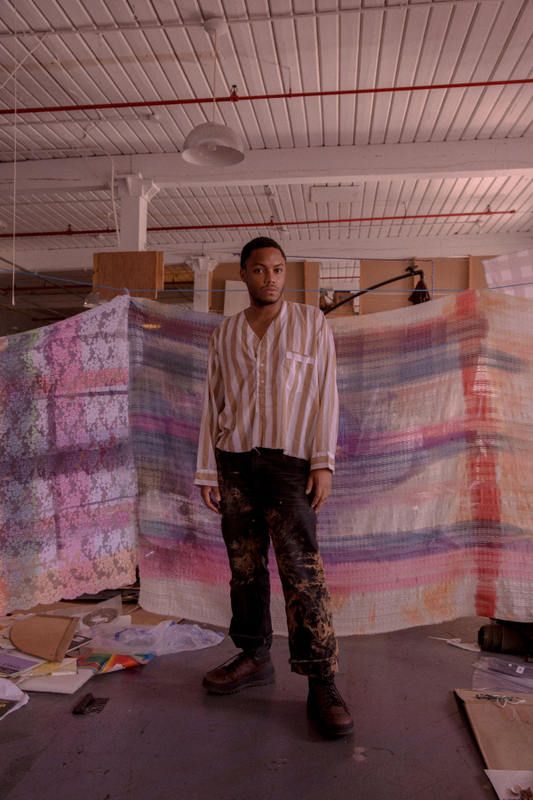 This emerging artist is presented at the Brooklyn Museum with the support of Deutsche Bank. 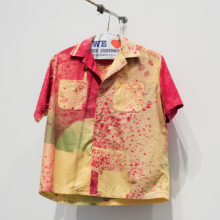 Create a cloth artwork inspired by our exhibitions. Explore your creative language through photography and assemblage at this free teen event!